Before I had R, I heard over and over how magical holidays are with kids, specifically Christmas. Last year was R's first Christmas, but she was only four and a half months old and while it was wonderful, this year Jordan and I agreed that we totally understand the magic of Christmas with kids. Honestly, at sixteen months, we still weren't expecting R to be super excited about everything, but she was so much fun. I mentioned in an earlier post how we took her to see the Christmas lights, and she shouted "woah! woah!" the whole time we drove around. Then we took her to North Pole City to pick out our annual Christmas ornament, and she ran around looking at everything. 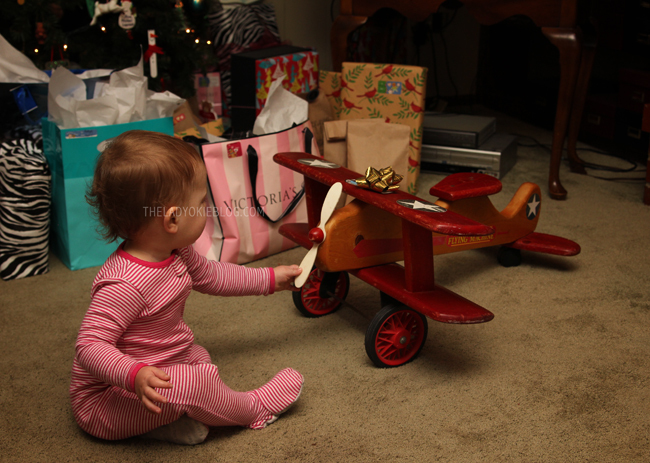 ^^^Jordan's parents gave R this airplane that was Jordan's when he was little. We are blessed to live close to both sides of our family, so we can celebrate with Jordan's family and mine. We spent Christmas Eve and Christmas morning with Jordan's family, and then we left around noon on Christmas day to drive to Texas and spent Sunday and Monday with them before driving home Tuesday. R got a great assortment of gifts and actually played with them and not just the boxes and tissue paper! We woke up on Christmas morning and opened stockings. We got R a drawing pad, a box of crayons, two food pouches, a three-pack of toddler forks, and a set of ABC flashcards. After stockings, we went to Jordan's parents' house, where we had breakfast and opened gifts! 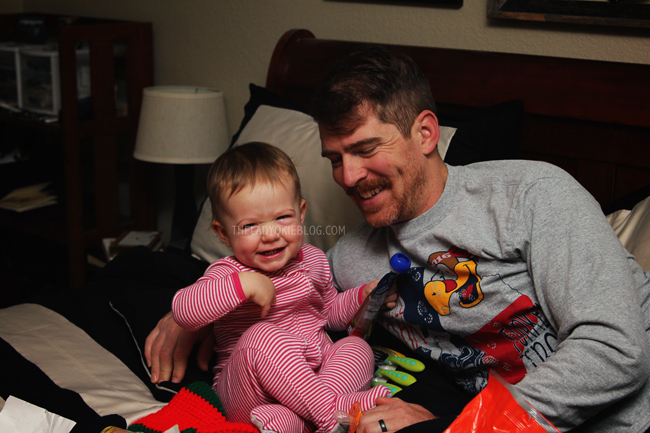 It truly was a magical Christmas this year, and I imagine it will only keep getting more and more fun as R gets older. And next year we will have another stocking to hang and even more fun to be had! See pictures from Christmas 2015 here. 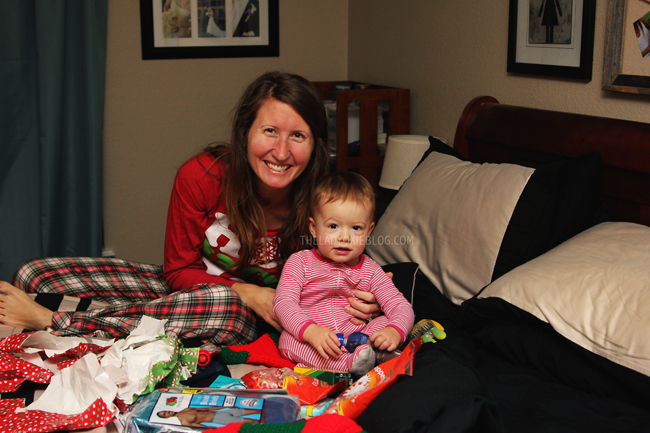 You look so happy in the pic on the bed... pure Christmas joy when you have a child to celebrate with. Oh my gosh...I couldn't agree more! Seeing Christmas through the eyes of a babe is a whole new experience, an absolutely amazing experience. Love all the pics of your sweet baby girl! So glad you had a fun Christmas! They do get more and more fun, like the time my little girl snuck down, saw the tree, and we heard a whispered, "Santa!" Such fun memories for you and for R.
I know Jack is younger, but it still was so magical to me this year because he was so enthralled by everything. I didn't mean to imply it isn't magical with a younger kid at all! :) Just last year she was 4 months old and kind of sat there and stared at us, and this year she was actually excited and it was so fun! I can't wait for Christmas with kids! It's been fun with just the two of us but we're definitely ready for more. SO surreal to think that next year we will have a 3rd stocking and a 6 month old! Every time I see a picture of R with you, I think she looks so much like you. And then I see a photo of her with Jordan, and she looks just like him. You guys made a perfectly mixed baby, haha. That airplane is SO CUTE! I agree--Christmas with a young kid is so fun. Gracie's reactions to her presents were so adorable. She was completely enchanted. I'm glad you guys had a good Christmas! That's so fun! I'm glad you had a good Christmas and got to see all your family. What a wonderful Christmas! Glad you had fun with your little lady!! Looks like a great time was had by all. Holidays with the kids are so much fun. 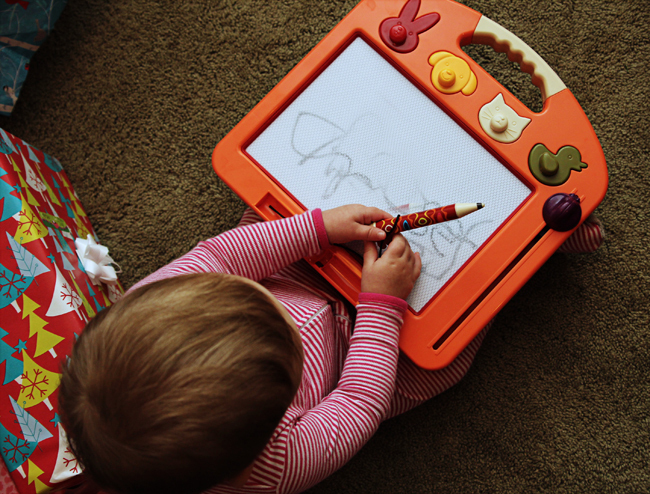 We never (and I mean like, never) buy the kids toys and stuff except for holidays and birthdays, and it makes it that much more fun to us to scour the Internet for something that they will love playing with when the holidays do roll around. Awwww what a special Christmas this year for your family!!! You all look so happy! I think it's so fun that R enjoyed her presents and the Christmas lights, so fun. I can't wait to see Zoe hopefully more into the festivities next year. So much fun! It's so different when they kind of get it, makes it way more enjoyable! Such cute photos!! She sure seems pretty happy with her presents! There is nothing like the excitement of kids on Christmas! I'm glad that you had a great Christmas! 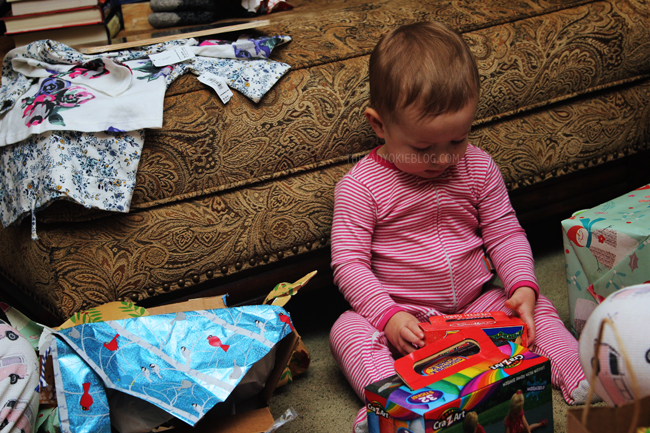 Amelia (who turned 16 months the day after Christmas) still really wasn't into the gift opening at all. I thought she'd get excited about the kitchen Santa brought her, but she ran right to our remote controls and wanted to play with those haha. 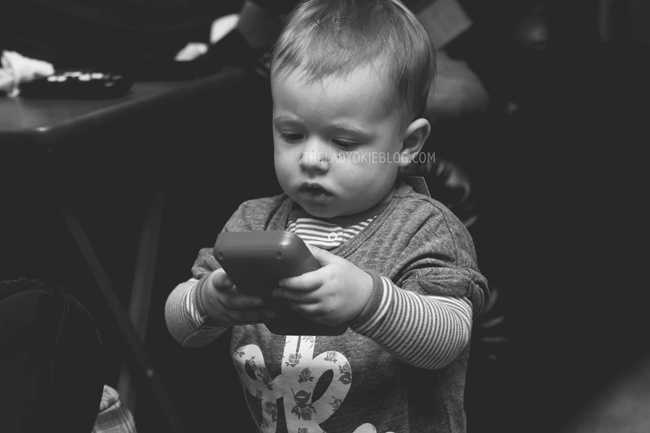 She was into the music at church, though, and all the ornaments on the tree, so that part was cute! I think next year will be even more fun! Honestly, we were really surprised that R was so into Christmas this year! We weren't expecting it, and it was really fun. How fun! I have to agree, Christmas with littles is much more fun! Even though my R wasn't into it this year at all! Love that little airplane that was once Jordan's! i'm a bit of a grinch now (at least i'm honest) but KC is convinced when we have kids i'll be better or enjoy it more, and i'm hoping that is true. 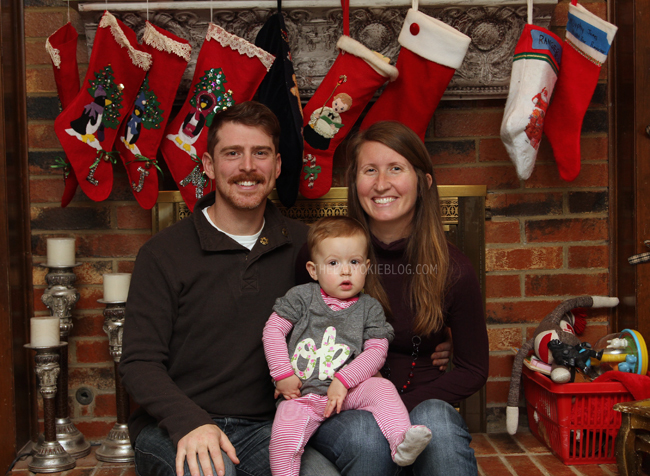 R looks so happy in these photos, and how exciting next year you'll have another stocking!